"Do not just correct Libya's rotten system step by step but make a clear cut with the past and a large leap into the future based on radical reforms from the beginning, quick privatization, minimum national debt, and a strong, new currency." In only a few months the world’s longest-serving dictator was ousted from absolute power and now even killed by his people supported by a joint Arab-NATO military campaign including jets from Qatar and the United Arab Emirates. Now it is time to look for the right decisions for the future of Libya and to focus on taking the first steps. - a strong new currency best coupled to the euro-zone. A reform team should analyse and copy the best practices from Eastern Europe. 2. Build up a brand new tourist industry as it will bring many new jobs and open the country. 3. Education is key, including learning English and French with a focus on the study of traditional Islam, the UN Charter and democracy (a little like in Germany after the end of the Nazi-dictatorship starting in 1945). 4. Radical reform of the bueraucracy which otherwise will delay or inhibit all new initiatives. 5. Collect the stolen national fortune of the Gaddafi clan, estimated by a former Libyan Energy minister at more than USD 200bn, by asking an expert foreign company like K2 Global Consulting to look after it and report everything openly to the public. The frozen money on Western bank accounts must be released within the next two months. Until then some countries like Qatar, France or Germany can give the new government credit secured by those stolen money accounts in the range of USD 10bn. The process of those large money transfers must be made transparent to avoid corruption cases. 6. Make all income from oil and gas transparent for the first time and collect the national wealth in new Libyan Investment Funds. Copy the best examples from Singapore (Tamasek and GIC) with international auditing by PricewaterhouseCoopers or other firms. Report everything online. 7. Copy the best incentive systems globally for investors and give them a tax-free period of ten years, followed by only 15 percent tax afterwards, and for each dollar invested add two more as debt finance to stimulate the transfer of know-how and the creation of new jobs asap. 8. Form investment councils with the EU and special states as well as with the US, Japan and China. 9. Avoid large international donors and conferences with big names attached. These often sound good but delay immediate chances and are too vague in the actions taken as was seen in Iraq and Afghanistan for ten years. They produce more smoke than clear visions. 10. The EU and the US as well as Asian countries should open their markets for ten years for all products from North Africa like fruits and textiles to stimulate growth and jobs. 11. Libya in this transformation process must become more independent from its oil income which is ultimately like cocaine for such states. They subsidise too much for the masses and neglect the establishment of a balanced and healthy mix in the economy which is the only way to create jobs and long-term stability. 12. The country could now pre-sell its oil in an amount of perhaps USD 100bn to the EU, the US, China and Japan as oil reserves with a good discount and get in return cash in advance for reconstruction within the next few months. 13. End corruption by clear and simple laws and actions from this point forward to prevent more billions being stolen from the people. 14. Transfer Gaddafi, his sons and the former head of intelligence to the International Court of Justice. 15. Pay all heroes of the fighting, their relatives and the wounded a national donation for their sacrifices. 16. Invite a National Convention involving all tribes and groups to agree to a new constitution within 12 months with the UN Charter, the French and Turkish constitutions serving as benchmarks. 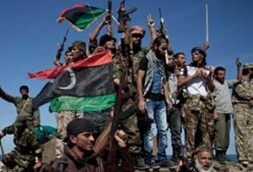 Libya needs a modern and fundamental law protecting freedom and a balanced division of power soon. A referendum should follow and only thereafter free elections for the parliament in September 2012. Elections, when held too early, are no good as the people must first get know the new faces, parties and directions. 17. Agree on a national pardon for all officials of Gaddafi if they are not involved in murder or large corruption cases. Do not repeat the mistake of Iraq which ousted all officials of the Baath party and stripped the country of a functional administration. Lots to do - but other countries have successfully done it with a fresh approach in the last 20 years. And Libya has a lot of carbon-money to invest.